I recommend Mair as a reliable, versatile and inventive graphics designer who places the needs of the client as a top priority. Mair was a given fairly vague list of needs, and she worked them into a design that exceeded expectations. Several times we came up with alterations to the original design request, and Mair remained professional and polite. Highly recommended. All art and design work completed by Mair is of an extraordinary quality. Her work is both imaginative and of a level which suits the client. I have been truly impressed by Mair’s exceptional attention to detail and high quality of work. …I have known Mair for 4 years. During this time I have found Mair to be studious, intelligent, thoughtful and always willing to contribute and always considerate of others. 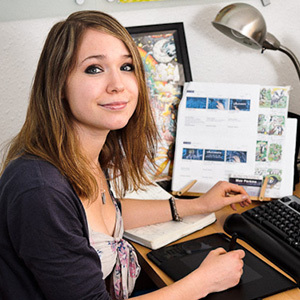 Mair has also been a Skills Advisor in the Visual Communication Studio for the past two years…she offers support and guidance in using highly complex design and animation software to students at all levels. She has been an invaluable asset to many students who benefit greatly from her knowledge and patience. Mair’s major strengths are her exemplary studentship, approach and integrity in all that she does. She is very open to learning and developing, both her own knowledge, skills and responses and that of others. Mair’s spoken communication skills are excellent and her interpersonal skills and aptitude for working with others are particular strengths. She is a happy and friendly person with great empathy and sensitivity. Fantastic!! As I imagined but better!